Ecstasy, is inspired by a night I had at Burning Man. My friends and I were on the dance floor at Opulent Temple and Diplo was DJ’ing. That moment when you let go of before and after and you connect with yourself, the people you are with and the dance floor. No words necessary. You are in the moment. The music sets you free. You can purchase Ecstasy now on iTunes and Courtney Act’s Kaleidoscope​ EP will be out July 7th. 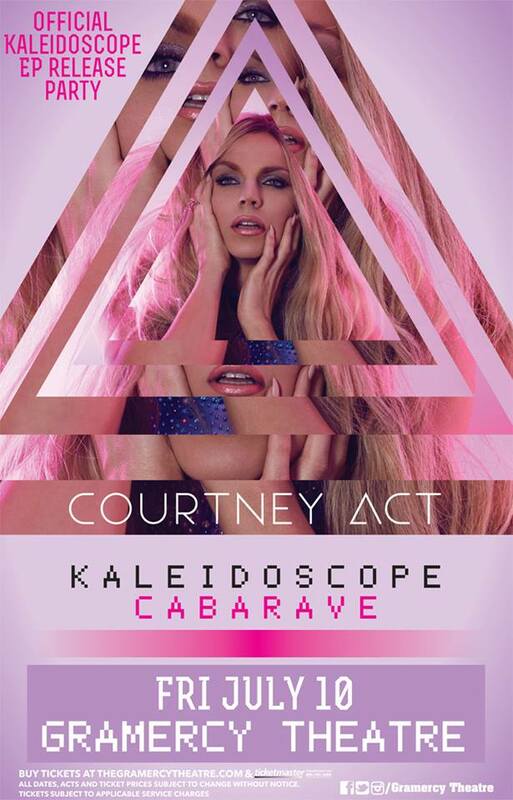 Click HERE to purchase tickets to attend Courtney Act’s release party Kaleidoscope CabaRave in NYC. Every Tuesday for the next 6 weeks Willam Belli, Alaska Thunderfuck, and Courtney Act will be live on air at 2pm ET/ 11am PT. Tune in on Out Q channel 106. Ecstasy, the first single off Kaleidoscope is here! Download it now and add it to your weekend playlist, I want you dancing around your bedroom in your undies to this song in the next 24 hours! You can “Pay what you want” through BandCamp, or get it on Amazon. Please feel free to Tweet, Insta, Fb, Snapchat and Periscope it too! You do not want to miss this party! “I am so thankful for your support and excited to make this music for you. The 20k funding goal scared me, I thought that I should make it lower and more achievable, but you have all proved me wrong and I am so grateful. There is only four days left; can we rally to get to over 35k? I’m releasing an EP this summer and would love you to be a part of it! I just flooded my basement cause my childhood dream of releasing a pop EP is coming true (Ok, so I called it an album during childhood, but there are 7 tracks so it’s practically an album). It’s coming out this summer, you can pre-order it now and get lots of other exciting treats over at my Kickstarter! Asking for help is mildly terrifying but I am so excited to bring this music to you so we can rock out on the dance floor this summer! Thank you for taking the time, I hope you click on the link and check out the video I made too! Get ready Europe because Courtney, Willam, and Alaska are taking over! Be prepared to be thoroughly entertained by these queens. They will perform their top 10 Billboard Comedy Digital Hit Song “American Apparel Ad Girls” among other hits. “Austin International Drag Festival will be a 3 night event (including one day stage) taking place in Austin, Texas (United States) on May 1st-3rd, 2015. It will be a weekend of shows and parties. The festival will showcase the best drag performers from all over the world. You will see up-and-coming drag artists alongside established and legendary drag superstars. All genres of drag will be covered from pageant queens to the fringe and freaky. This festival aims to boost the camaraderie of the drag performer community in a non-competitive environment and to further educate the public at large about the world of Drag!” according to the Austin International Drag Festival Facebook page. Courtney Act will be headlining at The North Door on Friday May 1st come out and join the fun! Loved being a video hoe in Andre Xcellence’s video for Game Of Thrones. The track is so much fun and I am excited to have some other things in the works with Andre and American Commission coming soon!